This succulent selection of ripe fruits makes a delicious, healthy treat, while the stunning preparation is sure to impress. A medley of sweet, juicy melons and other fruits are decoratively sliced into detailed leaves and flowers, and then garnished with seasonal berries. A medley of sweet, juicy melons and other fruits are decoratively sliced into detailed leaves and flowers, then garnished with seasonal berries. Why send candy or flowers? A gourmet sliced fruit platter is both tasty and beautiful. Send one as a thoughtful gift that's sure to please, order some for your next party or simply treat your family to an extra special dessert that's luscious and good for you too. Naturally sweet, fresh fruit is a delicious, nutritious alternative to sugary foods. Our sliced fruit platter is guaranteed to impress your corporate clients and is the ideal way to welcome guests to a hotel. 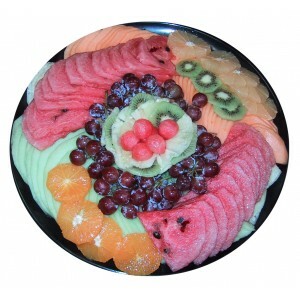 Artistically prepared, our fruit platters make the perfect centerpiece for any event or occasion. Contrasting colors create a stunning display while the combination of delicious flavors is sure to tempt everyone -- even those health-conscious guests who want to avoid certain treats and snacks. A 12 inch platter will serve 15 guests. 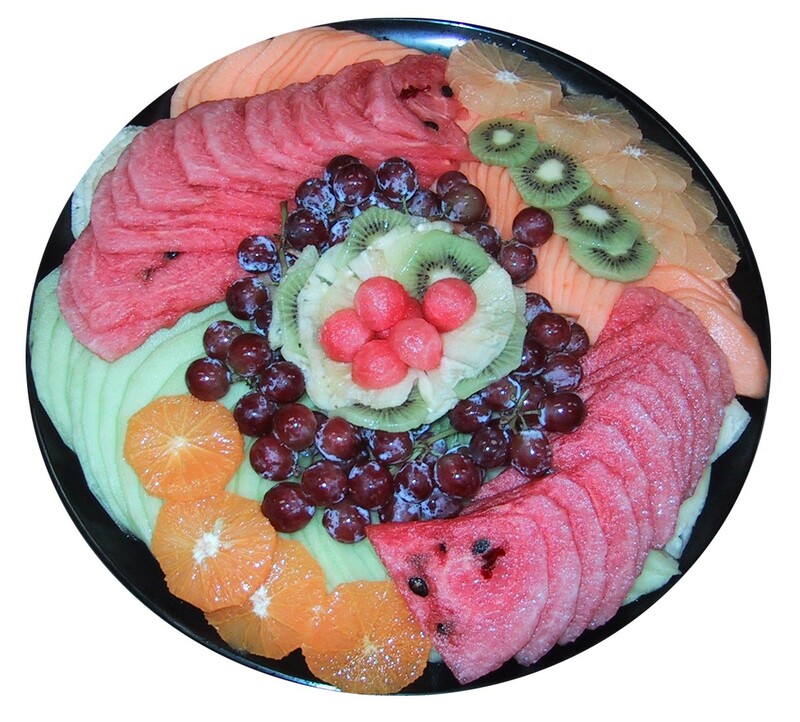 For larger gatherings, we offer 14 and 16 inch fruit platters, which will serve up to 35 people.